Life, Love, and… Oh, Look, a Squirrel! where you’re lucky if you can’t get out of the store with your wallet intact. We were, however, smart enough to eat beforehand, otherwise they could have took my wallet, took my rings, took my rolex and I’d looked at the brotha said, “Damn, what’s next?” But, Johnny Brusco’s Pizza saved me from having to Regulate. With that incident averted, we made our way to the baking aisle, and my ADD kicked-in. I decided I was going to make a cake. Now, I’m not a bad cook, quite the opposite most of the time. I say most of the time because I’m the Walter Bishop of the kitchen; everything I make is an experiment. While most of my concoctions end in success, about one in four or five dishes that I prepare are a complete abomination to the gustatory and olfactory senses. I scanned the mixes for the type of cake that I wanted to make. Then, I came across the box of red velvet cake mix and the little Chef Bishop in me started going crazy like Tiger Woods at a stripper convention. I love red velvet cake, but I’ve often thought that it might be better with chocolate icing rather than the white icing which usually accompanies the cake. This was my chance to affirm that belief. A couple of days have passed since that trip to the store, and with Amy in class tonight (She’s working on her master’s in information systems. I’m so proud of her. ), I figured the time was right to bring forth my creation to the world. I’ve have been baking the cakes while I have been writing this article. When I was mixing the cake batter and licking the bowl afterward, the question hit me, “Just what the hell is red velvet cake made of?” I always taste a hint of chocolate in it, but I really have no idea what’s in it. Then, it I thought I had it figured out. Angels must have brought down a little bit of heaven and split it between Betty Crocker and Pillsbury to put in their mixes. 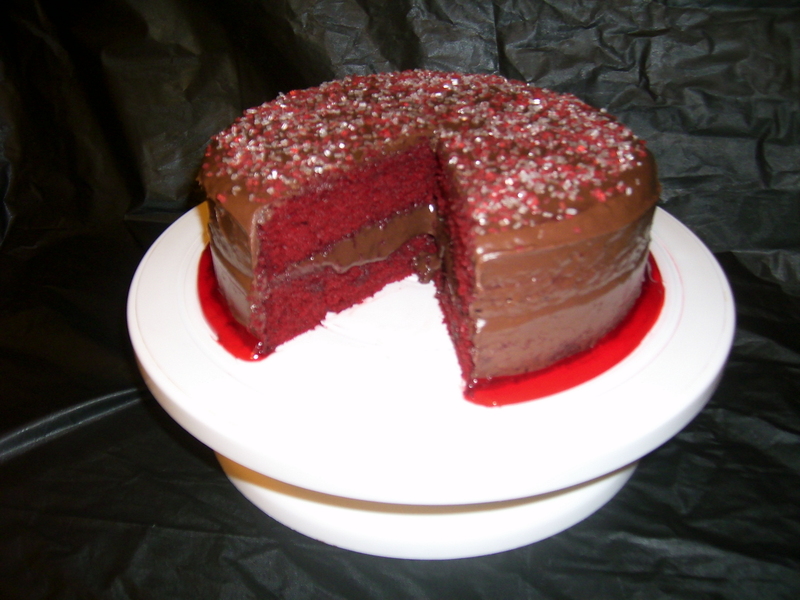 But, I quickly realized this wasn’t the case when I took in to account the color of the cake… red. So, my next thought was Beelzebub, himself, must have made a sweet, delicious, tempting cake mix version of sin. Immediately, I turned off the blender and backed slowly away from the blood-red batter. I didn’t remember cake mix being one of the seven deadly sins, but I sure as hell (no pun intended) wasn’t going to near this gooey batch of evil on my counter. Of course, I then realized how stupid I was being. I’m sure you’ve already guess it before I did. To see it written out like this, makes me feel foolish I didn’t see it earlier. Red velvet cake doesn’t come from beyond the pearly gates or the lake of fire. They both already have their own cakes — angel’s food and devil’s food. So, I’m left with no answer to my red velvet cake origins question, but using the Occam’s Razor theory of deductive reasoning I am going to assume that the real Walter Bishop went into an alternate universe and extrapolated the cake mix from there. Then, came back and sold the recipe to Betty Crocker and Pillsbury, thus making him rich enough to afford all those gadgets he creates on the show. You didn’t really think that Harvard or some scientific grant would really cover all the freakin’ dough he must have spent to put together his lab, did you? Well, the cake is now finished, and I now type before you as a broken man. My theory has been proven irrefutably wrong. Red velvet cake is, indeed, better with white icing, rather than with chocolate. Even the glass of cold milk that accompanied my trial, could not save the creation from its failure. I don’t know where I’ll go from here, but I will rise above this setback and continue to produce wild and crazy meals. Me and little Chef Walter Bishop wouldn’t have it any other way. Editorial Note: If you do know the origins or make-up of red velvet cake, please do not tell me. I am happy in my belief that red velvet cake is from another dimension, and any words to the contrary would only disappoint me, sending me into a dark, deep depression, and ending with a noose around my neck, hanging from the rafters of my garage. So, unless you want that on your conscience, just keep it to yourself. Besides, if I really wanted to know, I would have already Googled it. Fiction author with my first novel, Pariah, available December 2nd. This entry was posted in Lifestyles and tagged Beelzebub, Betty Crocker, Fringe, Johnny Brusco's Pizza, Occam's Razor, Pillsbury, Red Velvet Cake, Regulate, Wal-Mart, Walter Bishop, Warren G. Bookmark the permalink. I just want to know why there was not cake sent to work with Amy so we could taste for ourselves….. Geez!! !